The Atom is one of DC’s notable Golden Age super-heroes, and he appeared early – in 1940. 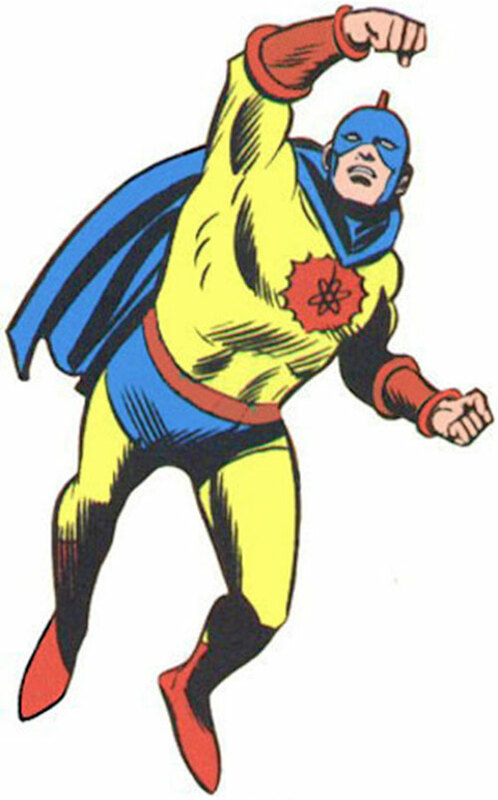 During the Silver Age a completely different person with different powers — Ray Palmer — reused the “Atom” name. This is a very old entry, slamming together somebody else’s biography with touched-up official stats and Who’s Who data. As such it could stand getting entirely rewritten. Known Relatives: Mary Pratt (wife), Albert Rothstein (godson, aka Nuklon). For decades Walter Pratt (who had with his wife Lydia a daughter Katherine, who as Kate Spencer became Manhunter) was mistakenly though to be Al’s son. Group Affiliation: All Star Squadron, Justice Society of America. Base Of Operations: Calvin College. The Atom is at once a formidable hand-to-hand fighter, strongman, scientist and athlete. He eventually came to acquire “atomic strength”, making him about a “Class 20” super-strongman. Al Pratt was, at 5’1”, unusually short – even for a man born around 1920. Frequently harassed for his stature, he was also humiliated when a mugger trampled him while stealing from Mary James, a young woman he had a romantic interest in. Demoralised, Pratt wandered off. He ended up buying dinner for an old beggar out of sympathy. As it turned out the man was Joe Morgan, a former heavyweight boxing champ. Pratt confided to Morgan about how his unimposing physique was making him miserable. The two men struck a deal. Morgan could live in a house Pratt had recently inherited from his uncle, and Pratt would be trained by Morgan to become a fighter and a strongman. Somehow, most of training process was accomplished within mere months. Morgan had calling cards made for Pratt that read “the Atom”. Pratt had been nicknamed “Atom Al” by bullies for his small size, but with the progress of physics in recent decades the word now stood for great power. Al Pratt was about to visit his old flame Ms. James when she was kidnapped for ransom. He swiftly freed her by beating up the abductors. Pratt later foiled jewel thieves at a debutantes ball she was attending. This inspired him to become a hero, and he even made himself a mask and costume between the two incidents. After the second case, he resumed training with Morgan. After the training was over Morgan left to launch a health camp in the countryside, and later became the physical trainer of Wildcat (Ted Grant) and then Guardian (Jim Harper). The Atom was a founding member of the Justice Society America and the All-Star Squadron. He also was one of the heroes exposed to the chronal energies of Ian Karkull – greatly enhancing his longevity and vitality. He was less successful in his years trying to woo James, as she was more interested in star football player “Truck” Tarbell or the mysterious Atom. In 1942, like most costumed heroes, Pratt enlisted in his civilian identity and became an Army tanker. 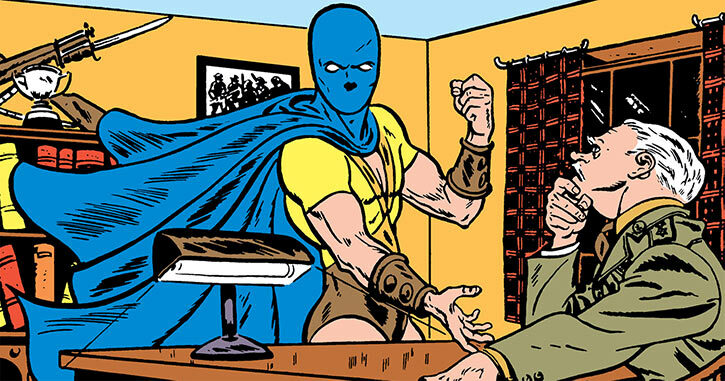 The government came to consider that costume heroes were more useful, and he resumed being the Atom. During a momentous clash between the All-Star Squadron and the Ultra-Humanite, the Atom ended up meleeing Cyclotron (Terrence Curtis), whom he thought was a willing accomplice of the Humanite. During the fight, Pratt was severely irradiated. As a strange consequence of the irradiation by Cyclotron, Pratt’s strength would grow to superhuman levels after the war, steadily developing. To reflect his new super-power, the Atom would change his costume. However, when the JSA was denounced by the HUAC in 1951, Pratt retired his costume identity as did his colleagues. During the war, Mr. Pratt also came to be involved with two babies. Curtis had sacrificed himself to stop the Ultra-Humanite, and Pratt helped Firebrand (Danette Reilly) care for Curtis’ baby daughter Terri. Later on the sympathetic Pratt helped the young Phantom Lady (Sandra Knight), who had become pregnant but was deserted by the father, Arnold “Iron” Munro. Given the lack of options in the 1940s, Knight had to carry to term and abandon the children in a “house for unwed mothers”. As the nurse insisted on noting down a contact and Knight was overwhelmed, Pratt gave his name. The judgemental nurse assumed that he was the father, and the boy was named Walter Pratt. Walt would only learn what had actually happened when he was in his middle age, decades later. The Atom’s private life during and after the 1940s is not well-known. He apparently studied as both a physicist and a journalist. He did marry Ms. James at some unclear point. He was largely retired from being a hero, but his occupation was unclear. 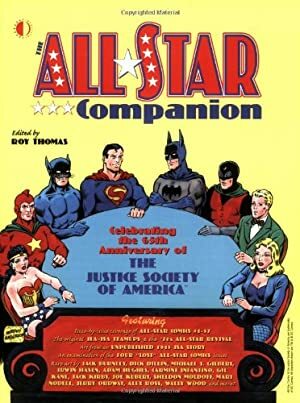 By the 1960s the JSA occasionally reunited, and the Atom was usually present. He thus met his Earth-1 counterpart the Atom (Ray Palmer) during the various interdimensional team-ups with the Justice League of Earth-1. Terri Curtis grew up and had a son, Albert Rothstein. The two men were close and Pratt personally trained Rothstein using Morgan’s techniques. 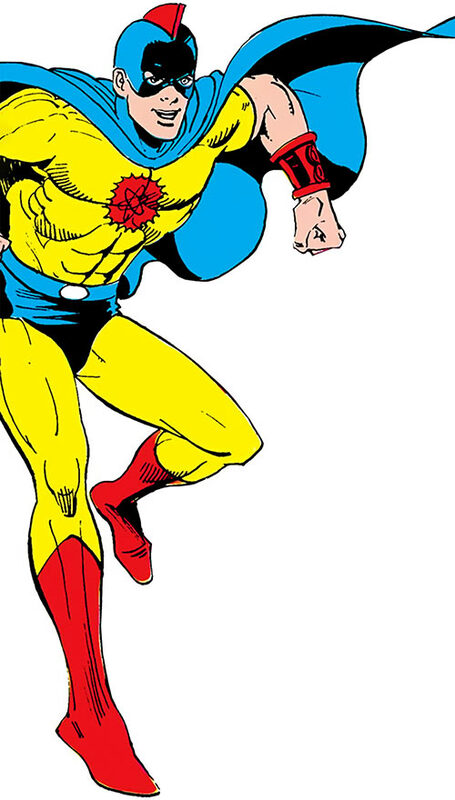 Rothstein discovered that the irradiation suffered by his mother during the clash against the Ultra-Humanite, back when she was a baby, had also given him super-powers — and he would become Nuklon. 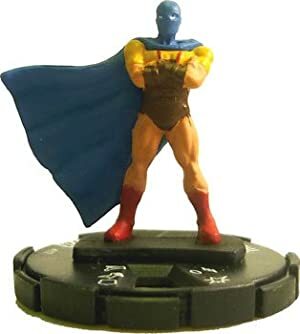 Nuklon joined the youths of Infinity, Inc. and they soon freed their forerunners of the JSA, who had fallen under the corrupting the influence of an evil spring. The Atom, still vital, fought during the Crisis on Infinite Earths in 1986, after which his native Earth-2 ceased to exist. Shortly after that the JSA exiled itself to fight against giants that would destroy the universe. This exile was eventually broken when it was revealed that this “Ragnarok” was actually a simulation set by Odin to study a possible future. During Pratt’s time in this limb Mrs. Pratt had died, though it is uncertain whether they were still married at that point. 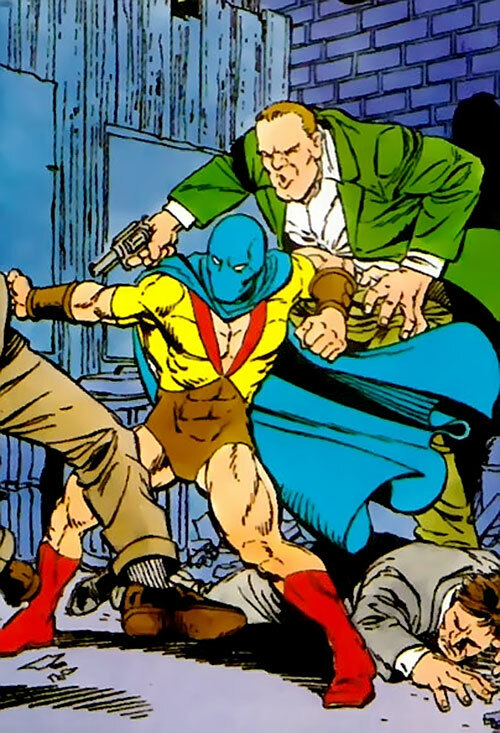 Two years later, in 1994, the JSA went in action against Extant during the Zero Hour crisis. The villain shot several of the veteran heroes with chronal energy bolts and the Atom, Hourman (Rex Tyler) and Dr. Mid-Nite (Dr. Charles McNider) were insta-aged into death. The first costume, with the blue hood and bare legs, is the earliest one. He wore the yellow, “more modern” costume with the fin after he was endowed with atomic strength. All Star Squadron (High), Calvin College (High), Justice Society of America (High). Secret ID, MID of short jokes. Prior to becoming super-powered, the Atom had STR 05 and BODY 06. 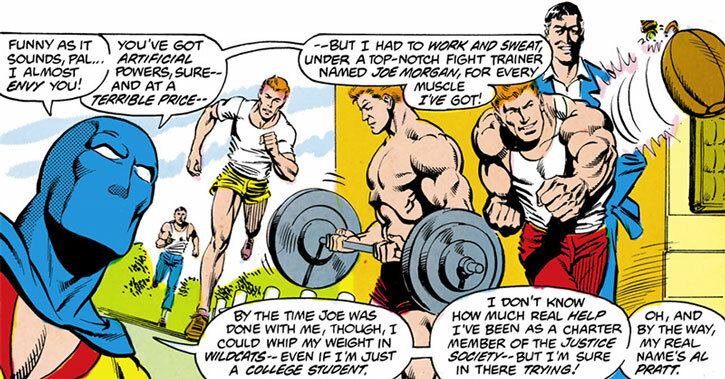 By the time of the modern era (the Kaminsky/Parobeck JSA series), the Atom’s superhuman STR had greatly faded – he was back at his pre-enhancement STR and BODY. However, he could access to STR 10 and BODY 08 as a Minor Marginal ability for one Phase – though that would leave him greatly weakened (STR 01) for the next 1d10 Phases. Compiled by Sébastien Andrivet, based on Knight of Shadow based on Mayfair (stats), and the biography written by David W. Stepp . Helper(s): Roy Cowan (“Power of the Atom” section), Dan, Darci.